Sorry, all units have been sold. Squad 3 - Busiest in the City. Squad 3 will feature its own license plate and graphics...and adorn the MARS "football" light on the cab roof. Squad 3 was stationed at 5349 S. Wabash Avenue in Engine 61 House. Over a year of development has been invested in Chicago Fire Department Autocar scale models. Countless hours of design, proofing, and improvements make this replica museum grade. Production of CFD Autocar Squad 3 will be limited to no more than 300 units. Fire Replicas are designed with the elite collector in mind, and manufactured in limited quantities to enhance future value. The CFD Autocar Squad measures 5.75"L x 2"W x 2.25"T and is securely displayed inside a custom case. 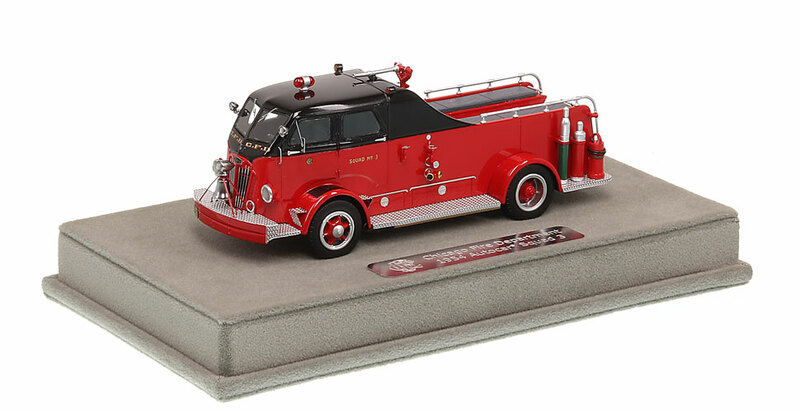 The case dimensions are 8"L x 4.5"W x 3.75"T and the platform includes an etched stainless steel nameplate with the CFD seal, department and truck name. Production Quantity: No more than 300 units. 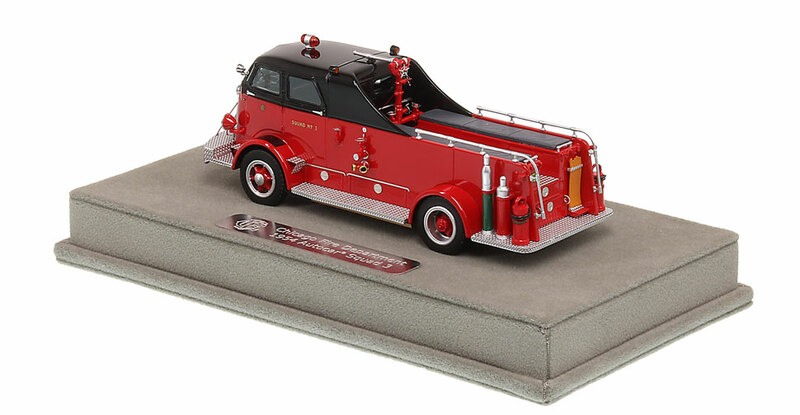 This Chicago Fire Department 1954 Autocar Squad 3 scale model is a museum grade replica. Like all Fire Replicas models, every detail is modeled to perfection and with razor sharp precision. The replica features the specific department configuration and graphics, leaving no detail overlooked. The display case is custom manufactured with high quality acrylic and resin. The stainless steel etched plate features the department and truck name, and department seal. This replica is a treasure to be displayed and admired and is in no way a toy. This is a first rate replica of an unusual rig. The entire process of ordering and receipt has been excellent. Love the 1954 CFD Squad 3 that I recently purchased. I would love to see someone produce a twentieth century 85' Pitman Snorkel model on any chassis. The snorkel should be articulating. Models of apparatus from the past are very popular because they were easily identified. Modern apparatus' all look the same. Quite pricey, but I justified it as being a necessity for what is probably a limited market piece. Vivid memories of the real thing racing down 12th street right beneath my office window. Its lines evoked a sense of speed. Maybe spent myself out of the market for anything else for a while. As to quality: Very Good but not anything better than some of my collection that I paid a lot less for. Now all they need to do FOR ME is a mid 50's Pirsch like the one Engine 44 had and a FWD pumper from the same era. Yes, I'll bend my purchase ceiling for these two also. the busest in the city. Outstanding crew, very hard working firefighters. The model is perfect . Every detail is true to scale. It became my favorite once I unpacked it. These squads are awesome. I've got three now. Can't wait to see more historic Autocar fire apparatus! I love the CFD Squad 4 it is beautiful and true to the original fire apparatus. I love the classic black over red color scheme. Although the actual vehicle is before my time it is a classic and a much have for any collector of die-cast fire apparatus. Once again "Fire Replicas" has created a miniature scale model of the Chicago Fire Department's Autocar squads in precise detail. History is captured!